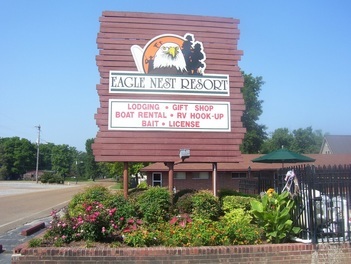 Welcome to Eagle Nest Resort in Reelfoot Lake, Tennessee! All packages include Lodging, Boat & Motor, Bait, Gas & Ice. Complimentary cookout twice weekly during prime season. Get Ready to catch the excitement! Eagle Nest Resort offers everything you need to make sure your fishing trip is one to remember. Call us today to book your trip! Fishing, Hunting & Eagle Watching. We invite you, your friends and families to visit our lodge, located on beautiful Reelfoot Lake. Enjoy the many activities nature has to offer as we have since 1956. Reelfoot Lake, named for a legendary Chickasaw chief, was formed by a series of earthquakes in the winter of 1811-1812. It's now home to some of the south's best hunting, fishing and eagle watching opportunities. Whether your chasing eagles, fowl or fish, or just wanting a great location for a family reunion or get together, we'll make it a time to remember. Come join in the fun! The cleanest facilities, maid service, and Southern hospitality. On the beautiful Reelfoot Lake, we'll make it a time to remember! Check out some of our latest pictures from our resort! Packages include lodging, guide and 2 meals each day in the blind. ​Shooting times start 30 minutes before sunrise, and last until 3:00 PM. "The cookout was great, rooms were clean and fresh, staff was friendly and made us feel at home." "Quick last minute weekend trip and these super nice folks had a house available. It was great!" "Nice and friendly people there, can't say enough about the boat house guys, they were very helpful." Schedule Your Eagle & Bird Watching Tour Today! From private tours, to specialty packages, Eagle Nest Resort can accommodate your Eagle watching tour! ​3 & 4 Day Packages are now available!